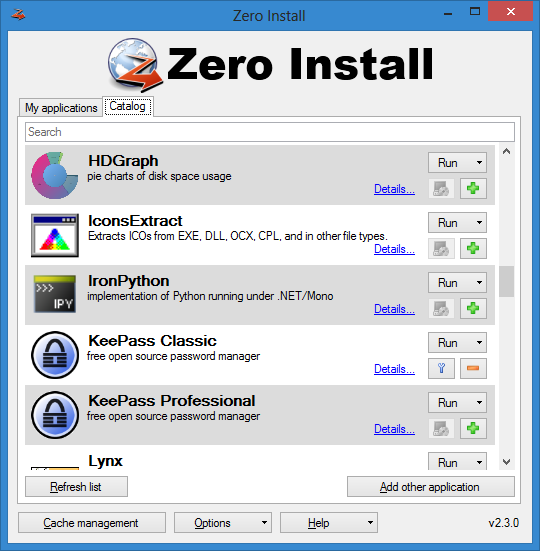 Zero Install gets information about application from so called feeds. These can be stored on any web server. There is no central app store that controls which applications can and cannot be published. However, we provide a catalog of well-known applications, so you do not have to search for individual feeds if you do not want to. This catalog is available on this website as well as within Zero Install itself. You can add additional catalogs from other sources as well. Applications are downloaded directly from the original publishers. They are not hosted or modified by Zero Install. The Publishing Tools allow you to easily create your own feeds.